Suzuki SV650 ECU/FI Warning Decoding via Arduino from synfinatic on Vimeo. 1. The Arduino board is too large and unwieldy to use on the motorcycle. 2. The Arduino uses it’s serial line for the USB which meant I had to do 7800 baud completely in software which used up a lot of CPU time. I finally ended up picking the Teensy 2.0 board by PJRC. It’s about half the cost of an Arduino, a quarter of the size and has hardware serial support for both USB (good for logging) and on pins (good for listening to the ECU). In the past I had played around with Eagle, but I always found it confusing and hard to use. This time I decided to try out DipTrace. Overall, I found DipTrace much easier to use, but it uses Wine under Linux/OSX and so it can be a bit buggy which really removed the polish from what overall seems to be a great app. 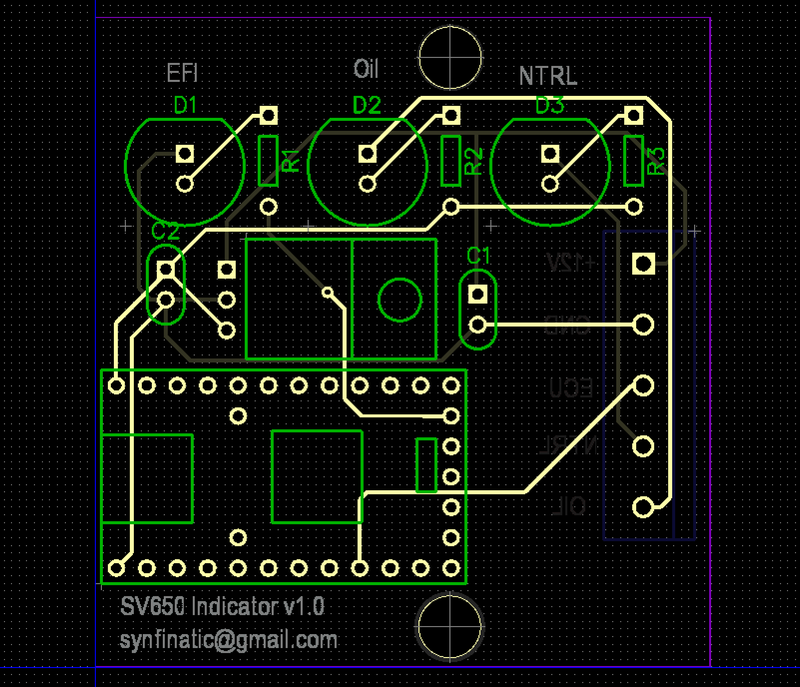 The biggest surprise and hardest part of the whole project wasn’t writing the code for the Teensy or designing the circuit, but rather trying to find a nice enclosure for the board and then designing the board to fit it properly. Realizing you have to think in 3D space (I had to lay down the LM7805 power regulator so the cover would fit!) and figuring out where the mounting holes should go (the spec sheet for the enclosure was painfully obtuse about this). This entry was posted in Arduino, Crackdays & Racing and tagged Arduino, ecu, EFI, sv650, Teensy. Bookmark the permalink.